An­nu­al roundups are com­mon in many fields, in­clud­ing ty­po­graphy. They allow us to ob­serve trends, re­view what has been ac­com­plished, and compare it to the ex­pect­a­tions. To this end, the re­views ought to be con­duc­ted with reg­u­lar­ity. This has not been the case with Cyril­lic font design roundups so far. Res­ults of a few oc­ca­sion­al type design com­pet­i­tions have served as the closest sub­sti­tute in Rus­sia, fall­ing short of cre­at­ing the big pic­ture one could only see on a yearly basis. Our first an­nu­al list be­low seeks to rem­edy the situ­ation. We are some­what am­bi­val­ent about this selection. The dif­fer­ence in im­port­ance between some of the win­ning entries may be so drastic that their ap­pear­ance on the same list may seem out of place. Con­sid­er­ing our se­lec­tion cri­ter­ia may help jus­ti­fy our choices. They were: 1. The font has to include the Cyril­lic char­ac­ter set, 2. The font (or its Cyril­lic com­pon­ent) must be released in 2013, and 3. The font should be leg­ally on sale to the pub­lic. These re­stric­tions left some designs, such as pro­pri­et­ary fonts and stu­dent pro­jects out. 36 font families were in­cluded in our long list. Our ed­it­or­i­al board and staff voted on the top ten. 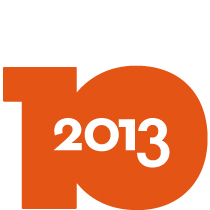 Without fur­ther ado, let us present you with the top ten Cyril­lic fonts of 2013, lis­ted al­pha­bet­ic­ally. The design of Bri­oni Serif is based on ex­per­i­ments with a broad-nib pen, however, the strokes evolved in the pro­cess of trans­lat­ing the hand-drawn sketches in­to di­git­al type. The type fam­ily’s power­ful rect­an­gu­lar serifs, tem­per­ate pro­por­tions and rhythm make it suitable for vari­ous print­ing meth­ods. The serif part of Bri­oni fam­ily is offered in two op­tic­al sizes: be­sides the nor­mal styles, there are a set of typefaces des­ig­nated as Text with lower con­trast between thick and thin strokes for small point sizes. Bri­oni Sans was designed by Nikola Djurek in 2010 as a com­pan­ion to the eponym­ous Serif font. Des­pite their kin­ship, the two type fam­il­ies are in­de­pend­ent tools in­ten­ded chiefly for composing long, dense texts. Bri­oni Sans is suit­able for con­tinu­ous read­ing thanks to its classical pro­por­tions and el­eg­ant shapes, mod­er­ate stroke con­trast and finely tuned kern­ing. On the technical side, Bri­oni fam­ily makes ex­tens­ive use of OpenType fea­tures (for example, there are nine types of fig­ures), has a wide range of weights, and of­fers sup­port for a large num­ber of lan­guages, in­clud­ing Cyril­lic and Greek scripts (de­signed by Al­ex­an­der Tar­beev in 2013). The young stu­dio Brown­fox is on its way to build­ing an im­press­ive font lib­rary in major ty­po­graph­ic styles since its de­but last year. It’s second re­lease, after Bru­tal Type, a new in­ter­pret­a­tion of DIN forms de­signed by Dmitry Rastvort­sev and Gay­aneh Bagh­dasary­an, is a sans-serif called Geo­metria. Its re­strained geo­met­ric forms go hand in hand with some un­ex­pec­tedly subtle de­tails. Its aper­tures are open and the shapes are well-pronounced. The font fam­ily may be re­min­is­cent of oth­er well-known typefaces in this category, such as Fu­tura or Avenir, but has a dis­tinct per­son­al­ity of its own. Brown­fox foundry comes to fill a void in Cyril­lic type mar­ket: geo­met­ric sans-serifs with a variety of weights, book old styles, and a con­tem­por­ary, fresh neo-grot­esque are all much needed ad­di­tions. Geo­metria of­fers sup­port for all West­ern European lan­guages, six­teen weights, Open­Type func­tion­al­ity, Cyril­lic and Lat­in lig­at­ures, and mathematical sym­bols, among oth­er fea­tures. This font was a win­ner of the Granshan In­ter­na­tion­al Type Design Com­pet­i­tion in the “Cyril­lic text typefaces” nom­in­a­tion. Cyril­lic and Greek al­pha­bets ap­peared in Ty­po­theque’s most pro­trac­ted pro­ject (as noted by Peter Biľak) in 2013. In a nut­shell, the font sys­tem of His­tory is a set of multi-style typefaces, which can be placed on top of each oth­er to ob­tain new solu­tions that yield in­fin­itely di­verse and spec­tac­u­lar dis­play ma­ter­i­als. Peter Biľak star­ted work back in 1990, in­spired by the lay­er­ing ef­fects of 19th c. Tuscan wood types. The idea of mixing dif­fer­ent in­gredi­ents in­to the font’s “skel­et­on” was giv­en new im­petus when Biľak and his company were work­ing on the Min­neapol­is—Saint Paul city typeface pro­pos­al. The stu­dio offered its cli­ent a pro­to­type font sys­tem that could be syn­chron­ised with the calendar on the de­sign­er’s com­puter and ran­domly se­lect his­tor­ic­al forms from its own font fam­ily data­base. For the new design, Biľak left only one “skel­et­on” (with the proportion of Ro­man in­scrip­tion­al cap­it­als) onto which 21 typefaces can be “hung”. An essay about the design pro­cess is note­worthy, as are the nu­mer­ous ex­amples of its use. The long-awaited Cyril­lic ex­ten­sion to Gill Sans, the di­git­al ver­sion of Eric Gill’s fam­ous typeface, from Bit­stream and Para­type needs no in­tro­duc­tion. Ac­cord­ing to Gill’s auto­bi­o­graphy, the type destined to be­come one of the most telling signs of the Brit­ish visu­al en­vir­on­ment, Gill Sans ori­gin­ated from let­ter­ing for the fas­cia of a pro­gress­ive book­shop in Bris­tol. Upon see­ing the let­ter­ing, Stan­ley Mor­is­on asked Gill to design a new sans-serif typeface for Mono­type. 1927 thus marked the be­gin­ning of a font which came to serve the Church of Eng­land, the BBC, the early Pen­guin book cov­ers, and Brit­ish Rail with equal con­fid­ence. The Cyril­lic ver­sion of the font now offered by Para­type is a part of a full mul­ti­lin­gual char­ac­ter set com­plete with old style fig­ures in six text weights in­clud­ing Ex­tra Bold de­signed by Vladi­mir Ye­fimov and Isa­bella Chaeva, and the newly ad­ded Ul­tra Bold de­signed by Ta­gir Safaev. A dis­arm­ing ty­po­graph­ic equi­val­ent of a va­cu­um tube, In­sti­tut grew out of the aes­thet­ics of mono­space types used on punched cards and name plates in end­less cor­ridors of So­viet re­search in­sti­tutes. Its forms may ap­pear heavy and even rough at first, but it cre­ates an unexpectedly pleas­ing ef­fect in set­ting. The ro­mance of ground con­trol centres and top-secret labor­at­or­ies is played up by Vy­acheslav Kiri­len­ko in his spe­ci­men. The pro­ject is notable for its suc­cess­ful brand­ing ef­fort, which cre­ates a vivid iden­tity and and helps to overlook the lack of the lower case or oth­er weights. Vic­tor Kharik’s for­mid­able pro­ject which took over a dec­ade to com­plete is a re­vived and expanded di­git­al ver­sion of a serif typeface de­signed by the So­viet de­sign­er Anato­ly Shchukin (1906–1994) and based on his sig­na­ture let­ter­ing style for book cov­ers and title pages. Ladoga is a cal­li­graph­ic let­ter, ow­ing much to a broad-nib pen and closely re­lated to early old style types based on hu­man­ist­ic manuscript hands. War­ren Chap­pell’s Tra­janus, is­sued by D. Stem­pel AG in 1939–1940 served as a more im­me­di­ate mod­el. Vic­tor Kharik’s ef­forts res­ul­ted in a soph­ist­ic­ated ty­po­graph­ic tool: four scripts (Lat­in, Cyril­lic, in­clud­ing Church Slavon­ic with spe­cial dia­crit­ics, Greek, and Hebrew), small caps, su­per­i­ors, in­feri­ors, al­tern­ate glyphs, four text and two dis­play weights. A full list of Ladoga’s fea­tures would take up a num­ber of pages, as demon­strated by the de­sign­er’s own de­tailed de­scrip­tion. When Peter Biľak de­cided to pub­lish his own magazine Works That Work in 2012, one of the first things he did was cre­ate an ori­gin­al typeface for the new pub­lic­a­tion. “I wanted the typeface to be the voice of WTW”, Biľak writes, “con­fid­ent enough not to need to show off, with the com­fort­able, re­laxed man­ner of an en­gaged storyteller, ready to handle long stor­ies, but also small cap­tions or titles. I named it Lava”. An­oth­er re­quire­ment was the quality of on-screen ren­der­ing on a vari­ety of tab­lets and phones in both high- and low-resolution en­vir­on­ments. To sat­is­fy these con­di­tions, Lava was giv­en open coun­ters and moderate pro­por­tions, with me­tic­u­lous let­ter­fit and kern­ing. In addition, the typeface in­cludes sev­er­al op­tions for nu­mer­als: old-style fig­ures, lin­ing fig­ures for use with cap­it­al let­ters and small-cap fig­ures, all of them in pro­por­tion­al and tab­u­lar widths. The type fam­ily sup­ports most European lan­guages based on the Lat­in al­pha­bet. 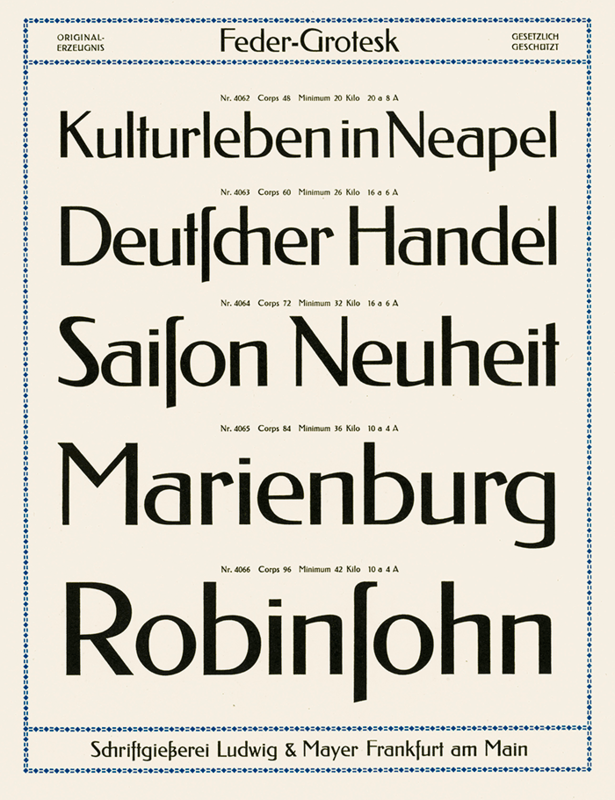 Mr. Palk­er and Mr. Palk­er­son is a su­per fam­ily of slab- and sans-serifs with an ex­ten­ded range of weights. “With Palk­er and Palk­er­son any copy is guar­an­teed to look like a pick­et fence. The six fonts al­low you to fine-tune what you’d like to make this fence out of, from the steel rods of Thin to the stone blocks of Black. In their simplest form, Messrs P&P; are designed for tight head­lines in Vic­tori­an or in­dus­tri­al style. They are a whole­some, some­what old-fash­ioned slab serif and a sans with small aper­tures”, is how Yuri Gor­don de­scribes his fonts. The de­sign­er is not one to skimp on ty­po­graph­ic “spices” and niceties: there are sev­er­al al­tern­ates for each let­ter, uni­case char­ac­ter sets, fanci­ful lig­at­ures, and small caps, un­con­ven­tion­ally de­signed to match the cap­it­als in weight and width at about one half of their height, so that two rows of small caps could stack one above an­oth­er or above the lower­case. The res­ult­ing two-storey con­struc­tions could be used to create a decorative ef­fect re­min­is­cent of Vyaz, ap­pro­pri­ate for fin de siècle peri­od ty­po­graphy or logo design. Like many oth­er fonts de­signed by Yuri Gor­don, the Palkersons im­me­di­ately found their way from the de­sign­er’s mon­it­or in­to print. Para­type re­leased the light weight of Ro­man­ovsky in March of 2013. This sans-serif ori­gin­ated in Osip Leh­man’s type foundry in 1910, a year after the re­lease of Lat­in pro­to­type Fed­er Grotesk by Jac­ob Erbar (1878–1935) at the Frank­furt foundry Ludwig & Mayer. The idea of cre­at­ing The di­git­al ver­sion of Ro­man­ovsky was ini­ti­ated by Dima Bar­banel’s Work­shop, who used it in Rus­si­an En­cyc­lo­ped­ic School Dic­tion­ary, pub­lished by the Saint Peters­burg State Uni­versity. The bold weight was de­signed later by Olexiy Volochay based on the Lud­wig & May­er foundry cata­logue (Leh­man did not have a bold style). The mul­ti­lin­gual Ro­man­ovsky is a hall­mark of Ju­gend­stil (Art Nou­veau) with a number of dis­tinct­ive fea­tures, such as about twenty lig­at­ured cap­it­als in Latin and Cyrillic, ac­cen­ted Cyril­lic vow­els in up­per and lower case (in­clud­ing the seldom-accented let­ter “ё”), and the re­cently ad­op­ted rouble and hryvnia signs. Vac­cine is a rhyth­mic­al slab serif font, char­ac­ter­ised by the soft roun­ded corners of its serifs and ter­min­als and the sharp junc­tions of its ho­ri­zont­al and ver­tic­al strokes. This slightly wide face has a vir­tu­ally im­per­cept­ible stroke con­trast. The fam­ily con­sists of five weights with cor­res­pond­ing true it­al­ics. Vac­cine’s suc­cess demon­strates that in­terest in slab serifs shows no signs of abat­ing and begs com­par­is­on to oth­er designs, such as Type­To­geth­er’s Ad­elle, with re­cently ad­ded Cyril­lic char­ac­ter set de­signed in collaboration with Al­ex­an­dra Korolkova.